Addo Rest Camp - Addo Accommodation. The popular main rest camp of the park offers a wide variety of accommodation units to suit all tastes and plenty of activities to keep visitors busy. A unique feature is the waterhole lookout point, floodlit at night, within the camp as well as the underground hide, allowing close encounters with wildlife at the waterhole. The evenings are punctuated with the calls of lion, spotted hyena and jackal, while francolin and bokmakierie herald each dawn. Accommodation units are situated within easy walking distance of each other, and of facilities such as the swimming pool, restaurant and shop. The original elephant section of the park was proclaimed in 1931, when only eleven elephants remained in the area. Today this finely-tuned ecosystem is sanctuary to over 600 elephant, lion, buffalo, black rhino, spotted hyena, leopard, a variety of antelope and zebra species, as well as the unique Addo flightless dung beetle, found almost exclusively in Addo. The park can exclusively claim to be the only national park in the world to conserve the “Big 7” – the Big 5 as well as the southern right whale and great white shark off the Algoa Bay coast. Plans are currently afoot to include the proposed proclamation of a 120 000 ha (296 500 acre) Marine Protected Area, which includes islands that are home to the world's largest breeding populations of Cape gannets, and second largest breeding population of African penguins. 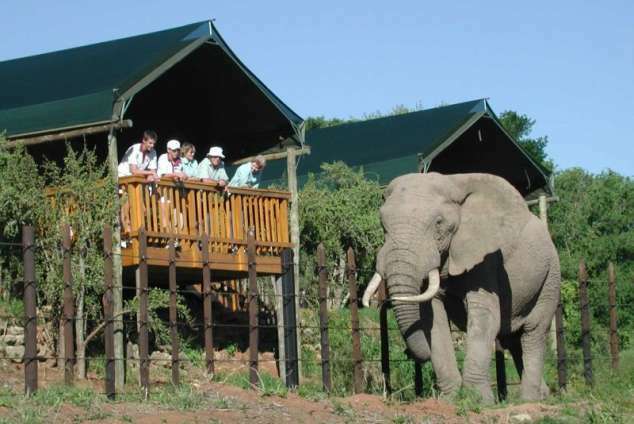 Addo Elephant National Park seeks to be fully integrated into the regional landscape. It conserves and enhances the characteristic terrestrial and marine biodiversity, ecological processes and cultural, historical and scenic resources representative of the Eastern Cape, for the appreciation and benefit of present and future generations. 5825 page views since 27 Oct, 2015. Last updated on 24 Jan, 2017.